Originating as private venture military transport based on stillborn An-60 64-73 seat civil airliner designed to meet 1967 specification, the revised design, following issue of military requirement in 1968, included relocation of engines above wings. Two static test airframes, and two prototype An-72 were built at Kiev. The first (SSSR-197744) flew on 31 August 1977. Intended to replace the turboprop-powered An-26 in Aeroflot service, its high-lift devices and multi-wheel landing gear make it suitable for operation from unprepared airfields with snow or ice covering and accommodate about 52 passengers. Overwing engines exhaust over the wing and trailing edge devices, to increase lift at low airspeeds. The NATO named Coaler is designed for rough-field operations and has a rear cargo door/ramp. A production order was placed in December 1980 for an improved An-72A version, when manufacture was transferred to Kharkov, Ukraine, where first production An-72 flew 22 December 1985. The An-72, and the related An-74, only received its airworthiness certificate in 1991. By mid-1992, about 50 were in industrial service, although none with Aeroflot. The An-72 platform went on to spawn other variants that included maritime surveillance An-72P model, the An-71 "Madcap" AEW model and the An-74 "improved Coaler" upgraded engines and a conventional engine mounting. 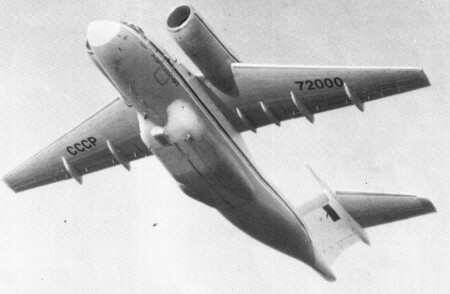 The An-72P armed surveillance and maritime patrol aircraft was developed in conjunction with Israeli Aircraft Industries and featured revised cockpit glass design, specialized Elta radar, electronic warfare systems and long range day/night observation equipment and systems. The An-74 is a civil development of the An-72.